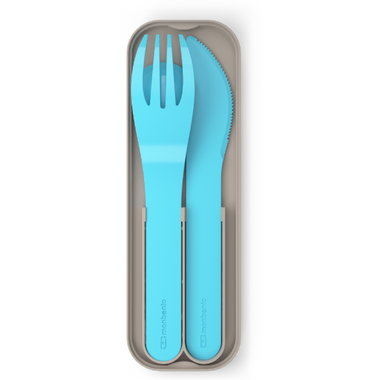 Made of PLA, a 100% biodegradable plastic produced from plants, the MB Pocket Color set that includes a fork, a knife and a spoon combines utility with ecoresponsibility! The era of single use and easily breakable cutlery is over! Reuse the resistant and dishwasher-safe MB Pocket Color that decomposes if left in nature. 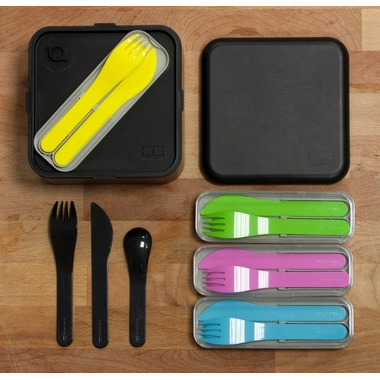 This lunch cutlery set is perfectly sized to fit under the upper lid of the MB Original or MB Square. Mobile and chic the MB Pocket is the indispensable accessory! It's okay. I bought it to carry around so I don't waste plastic on disposable cutlery. The main problem is that the case is very complicated to put the cutlery back in. Nice product. The big selling feature is that it is compact and fits nicely into the monbento lunch box.